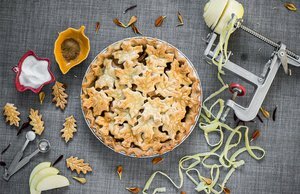 I consider myself very lucky because my job is to eat food, then write about it. 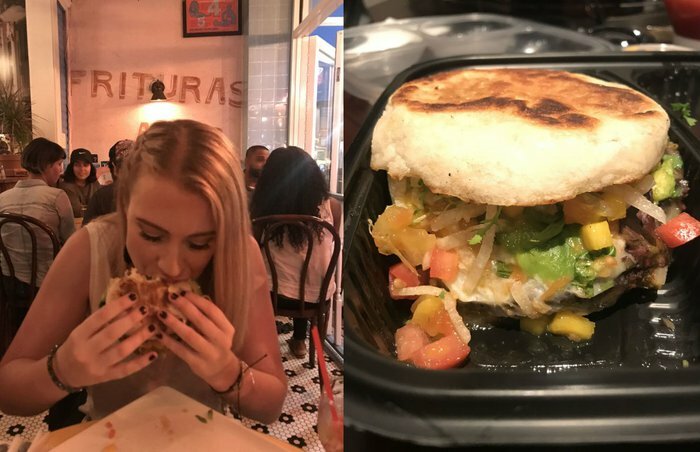 This year, I was fortunate enough to sample new products in our office, taste trendy dishes at gorgeous restaurants and enjoy simple pleasures at low-key bagel shops and pizzerias. I can't pinpoint everything I've eaten since January, but perhaps you'll be tickled by the highlights. Some of these foods I made for myself - but most were made by talented chefs and bakers, thank God. I'm a young Martha Stewart in the kitchen when it comes to simple boxed and frozen ingredients - shout out to Velveeta mac and cheese, love you - but if you're expecting something crafty from me, you're better off asking someone else. Let's leave it to the pros. For context: I live in New York City, so you'll find that a lot of the neighborhoods mentioned are within Brooklyn and Manhattan. Outside locations include my hometown of Plattsburgh, New York, and places I've traveled to within the last 12 months: Italy, Canada and the Caribbean. 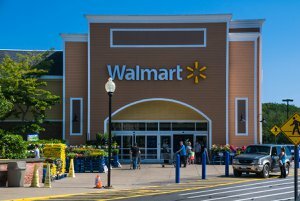 About one-third of the items were purchased, and the rest were provided by their makers for review. With that being said, I remain completely unbiased and I'm here to tell you what's good and what's not. You, reader, are my friend and I love you. 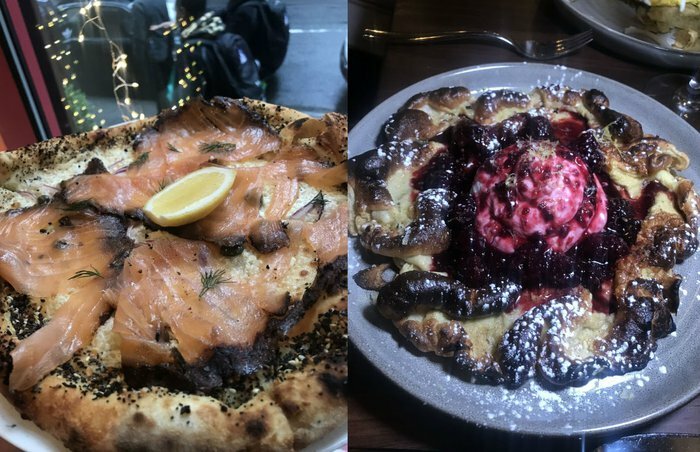 I obviously did not keep track of every single thing I ingested over the last 365 days (and I'm sure you'll thank me for that), but I think it's worth mentioning that all the grub included below left a major imprint on my palate. So without further ado, here is "everything" I, Taylor Rock, The Daily Meal's news and drinks editor, ate this year. In 2017 when I was a wee lass, I was naïve to the many delicious cheeses I had yet to experience. 2018 was a big year for Brie, which I fell in love with at first bite. It all started with one slice, strawberry jam and a Wheat Thin. Now you can't trust me around a cheese board. 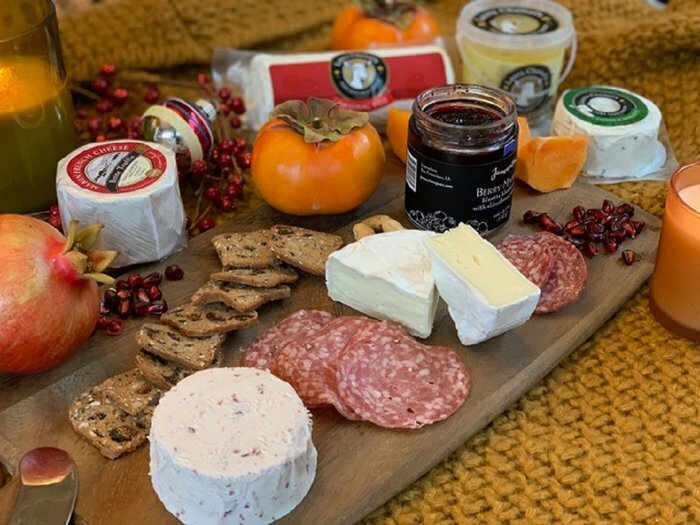 This one features Brie and petite truffle from Marin French Cheeses, plus some super-moist goat cheese from Laura Chenel's. I'm not saying I can eat a whole wheel in one sitting, but I'm not not saying I can either. If you're looking for dope Mediterranean food in the Toronto area, Tabule is the place to be. Never in a million years did I ever expect to fall head over heels for cauliflower or eggplant - but these dishes shine. 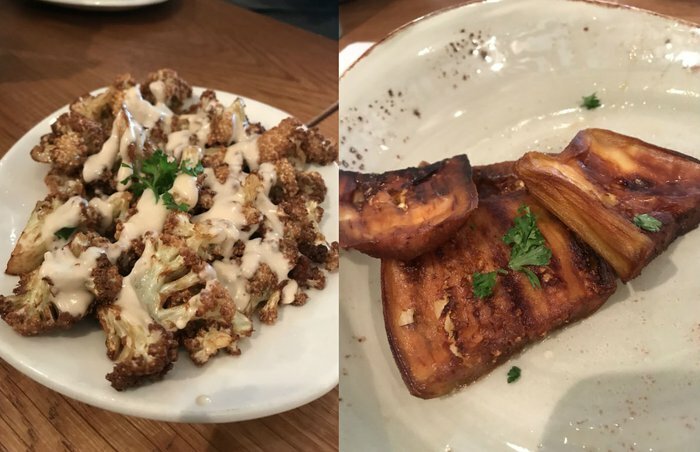 The arnabeet, or flash-fried cauliflower, was perfectly crispy and flavorful, but the fried eggplant was unlike anything I've ever tasted before. Its lemon-garlic coating was incredible and it legitimately melted like butter in my mouth. I keep this memory in my heart. No, I did not eat an actual bird's nest. (Although apparently people actually do eat bird's nest soup?) Anyway, the items in question here are just deviled eggs - one of the all-time best finger foods in the game. These ones were placed on a bed of crispy noodles, then heavily smoked. They tasted just like a campfire. Interpret that as you wish. The cute little shrimp on the right was wrapped in crispy noodles and dunked in Scotch bonnet sauce, which tasted like a chipotle mayo. 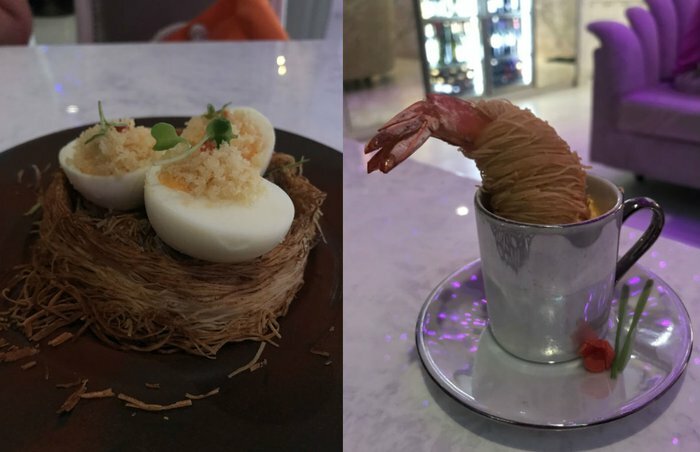 I enjoyed these at Wonderland, Royal Caribbean's Alice in Wonderland-themed restaurant aboard the biggest cruise ship in the world, Symphony of the Seas. This isn't your typical French onion soup. Cucina in Woodstock, New York, does things a little differently by giving you more of what you really want: bread. This big cheese-covered slice floated on top of the usual beef broth and caramelized onions. I definitely love a French onion with more goopy Swiss on top, but this was a cool switch-up. 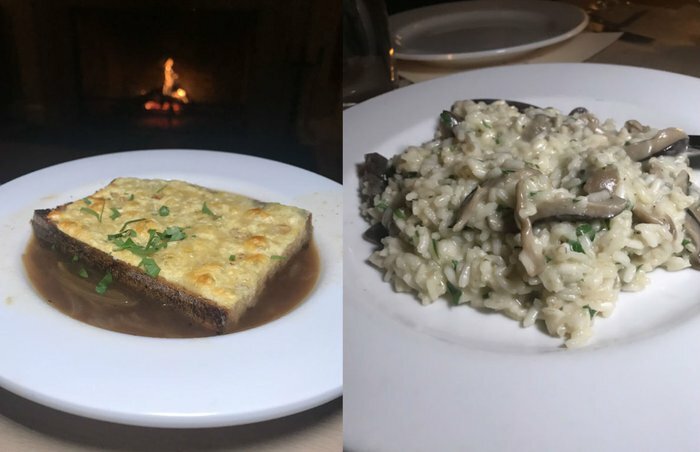 This wild mushroom risotto followed, and although it was served family-style, I could've eaten that entire plate by myself without feeling an ounce of shame. Like, cheese and mushrooms? Sign me up. Now that sounds like an odd combo, but I can promise you there were about 10 additional courses between the two. Talk about a food coma. 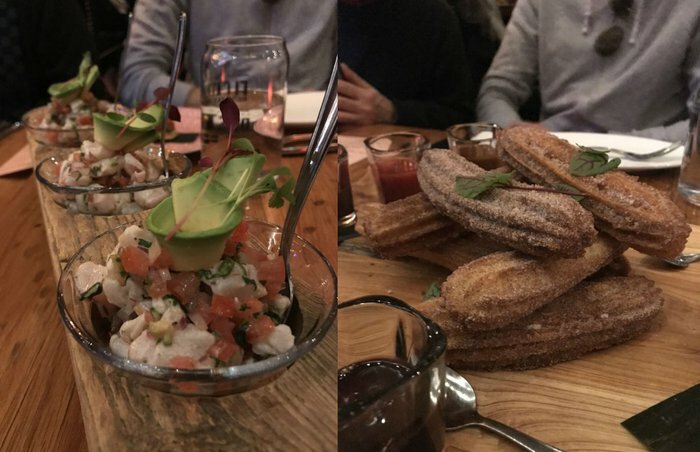 The ceviche has Pacific snapper marinated in lime juice and olive oil, pico de gallo, green olives, oregano and a cute little avocado rose. Those were yum in the tum, but let me tell you 'bout my best friend also known as these churros. They are fluffy, moist and sugar-coated - three things I look for in a man. They came stacked like Lincoln Logs with chocolate, strawberry and cajeta sauces. Don't worry, Father is OK. Strozzapreti is an elongated cavatelli, but when translated from Italian to English it's "choke the priest" or "priest-strangler." I don't know why this pasta has such an aggressive name, and I'm not sure I want to find out either. This one was served with vegetables, cream sauce and shaved truffle (my favorite) at Podere San Giuliano in Bologna. If you asked me what a Fabergé egg was before I went to Italy, I would have astral-projected myself into space. Now that I'm writing this, I've found it's actually a jeweled collectible egg - and that is not what I've eaten here. So I'm just going to let you know that I'm pretty sure this plate from I Portici La Ghiacciaia in Bologna was a poached egg with veggies and caviar in some sort of asparagus puree and cream topped with bread crumbs and a gold leaf. Since I don't normally eat chicken - unless it's coated in 24-karat gold, ha ha just kidding - eggplant parmesan is one of my top go-to meals. This one is from Coppola's in Kips Bay. The best part was all of the toasty charred cheese on top. It was a nice break from the pre-made pucks from the frozen section of Trader Joe's (which tickle my fancy just the same!) but due to poor service, this dinner took three hours from start to finish when it should've taken just one. We're all about transparency here, right? As far as brunch foods go, nothing holds a candle to eggs Benedict or its other variations including Florentine (spinach) or royale (smoked salmon). This one is just a classic benny sans ham with some chives and a simple side of greens tossed in vinaigrette from The Regal in Williamsburg. Check out how perfectly toasted that English muffin is. Nothing ruins eggs benny like smooshy, inadequately toasted bread. Right on. Do other bagels exist? There's nothing like an everything bagel with salty cured salmon, red onion, tomato and capers. This one is from Smith Street Bagels in Carroll Gardens. 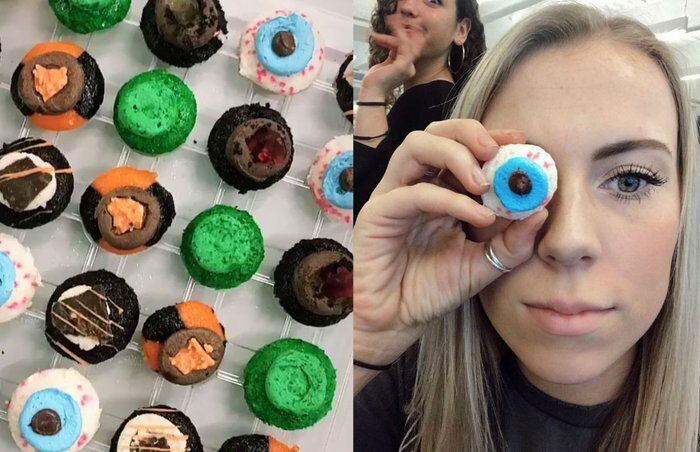 Baked by Melissa is a New York City institution, and I finally got to try their wares. Not only are these mini cupcakes super cute (or in this case, super spooky), but they're also very addicting. I kid you not, I probably ate the majority of three trays. The green ones were the best. I'm pretty sure they were just vanilla with green food dye, but vanilla is the best flavor - and if it isn't broke, don't fix it, right? 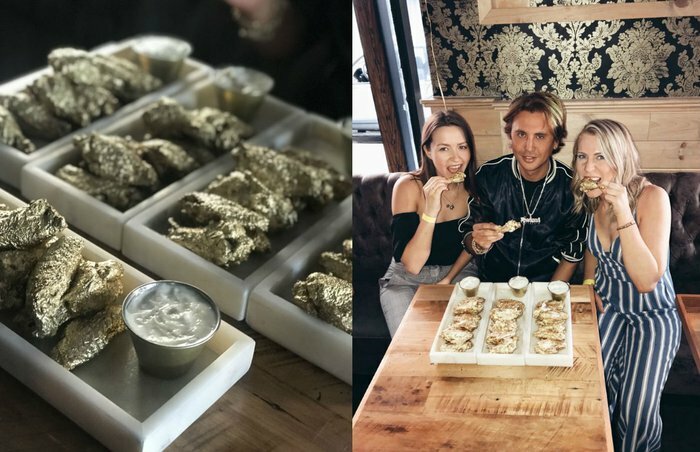 Jonathan Cheban aka Foodgōd aka Kim Kardashian's bestie came through drippin' with these coconut butter, chipotle and honey chicken wings coated in real 24-karat gold at The Ainsworth in the East Village. What's up with people eating things covered in gold? Who knows, but this sauce is a great alternative to lipstick if you forgot it. 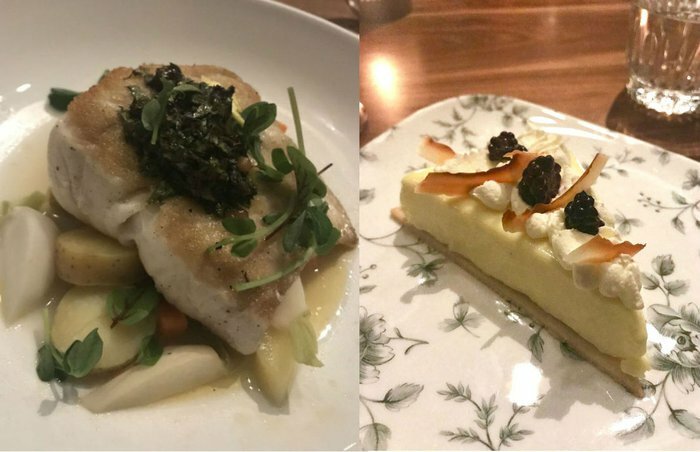 This halibut fillet was prepared at The Civic, a new-ish restaurant inside of the Broadview Hotel in Toronto. It came with potatoes and vegetables. For dessert, I indulged in this pretty lemon chiffon pie with mascarpone, toasted coconut and blackberries. Mmm, mmm, mmm. I absolutely devoured the famous "bleeding" meatless Impossible Burger at The Regal in Williamsburg. While I don't necessarily think it tastes exactly like real beef, I wouldn't even want it to. 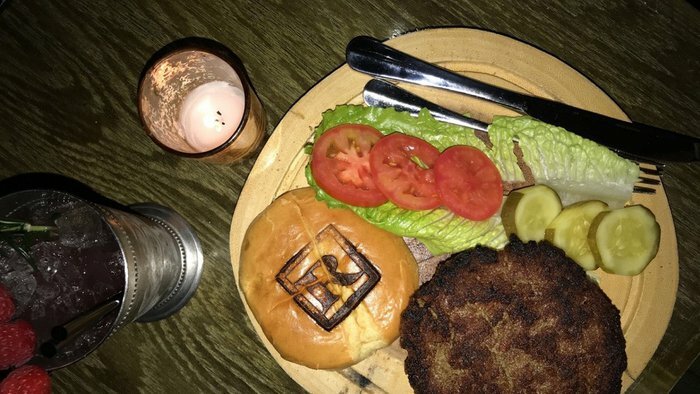 It was the bomb.com, and it certainly looks like a legitimate hamburger. I've followed chef Dominique Ansel on Instagram for a while now and have still never had the cronut, which is truly a tragedy. But! 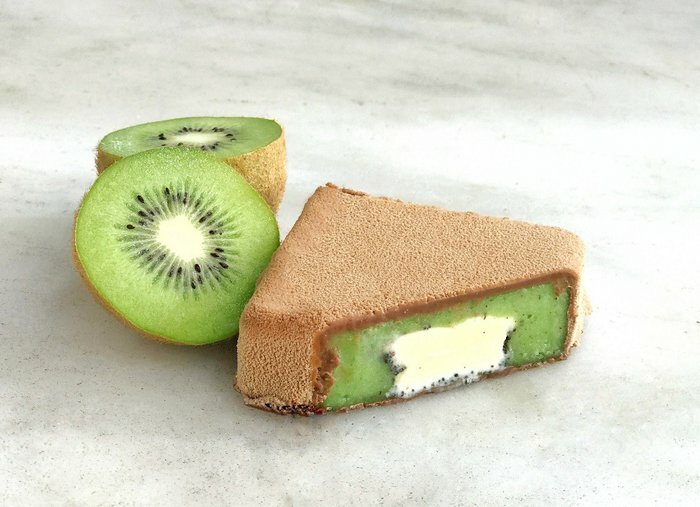 I have had his summer seasonal kiwi sorbet bar, and for that I am forever grateful. It's super cute and looks just like a fuzzy kiwi. It has a Tahitian vanilla ice cream center and is coated in chocolate. Need I say more? Latkes are delicious. It's just a fact of life. This little potato pancake is stacked with cream cheese, cucumbers, onion, tomato and an egg cooked over-easy so that when you cut in you get that gorgeous river of yolk. This was one of two go-to breakfasts at my favorite coffee shop, Marcy and Myrtle, when I lived in Bed-Stuy. The other was a croissant sandwich with sharp cheddar and sliced hard-boiled eggs. This salad was Nice. Get it? Anyway, it came with mixed greens, Nicoise olives, tomato, red onion, capers, hard-boiled egg and seared tuna with a refreshing orange-thyme dressing. It's on the brunch menu at Verde on Smith in Carroll Gardens. Pairs pretty well with a bloody mary. Just sayin'. Up until this year, I had always been afraid to try oysters, because they look disgusting. I can't remember where I downed my first one, but it certainly wasn't my last. The bad boy on the left was prepared by chef Jeremy Fall during a collaboration with the cosmetics brand Shiseido. 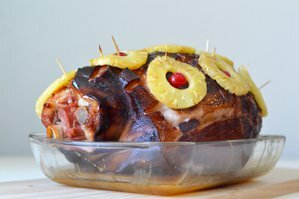 It's filled with diced cucumber, sesame seeds, little baby chips and a bloody mary sauce. The ones on the right are from Kittery in Carroll Gardens. 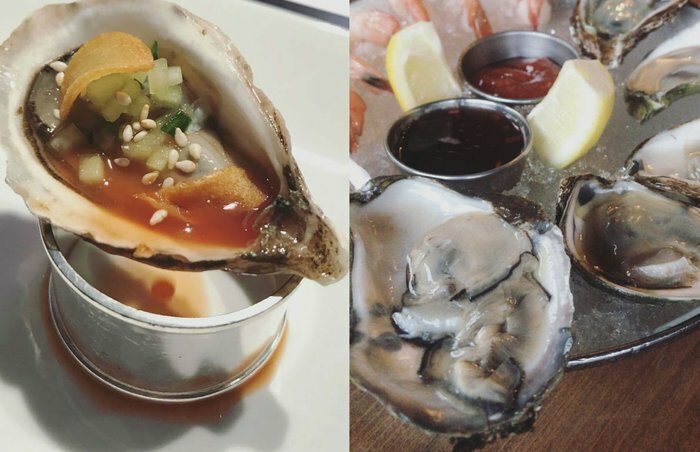 Everyone says these oysters are the biggest and baddest - and they're only $1 each. From the average dollar slice to John's of Bleeker, pizza is a godsend. It's practically its own food group. Am I right, ladies? The saucy reheated triangle on the left is from Pino's La Forchetta in Park Slope. It's my go-to delivery 'za in Brooklyn. Now for the slices on the right: One is obviously margherita and the other is a street corn pizza. Everyone and their mother made fun of me for eating this, but I stand by it because it was so good. I can't tell you where I got it, though. I had a long night in Bushwick. Let's leave it at that. Pizza is life. Say it louder for the people in the back! What you're looking at is a gorgeous bufala pie from Il Banco del Vino in Bologna, Italy. It's made with San Marzano tomato puree, basil and huge chunks of mozzarella from Campania. The more cheese, the merrier. That's my motto. These dishes were prepared using Stella Artois Cidre at Maple Shade Farm in Delhi, New York. 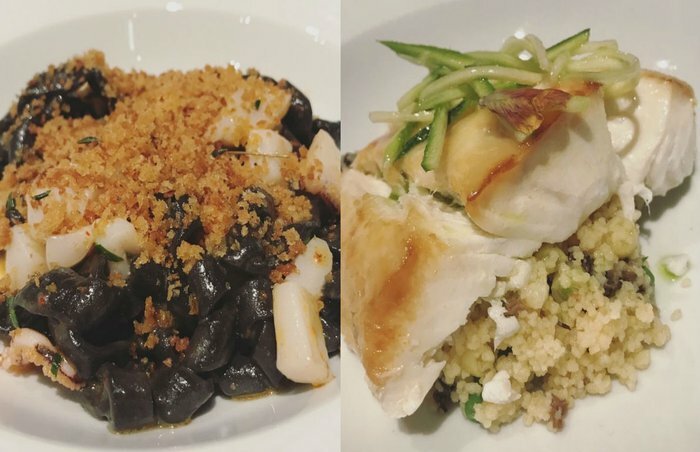 It was perhaps the coldest, rainiest and windiest day of the year, but these hearty dishes warmed me from the inside out. Apart from the Cidre, the soup featured a chutney, fermented wild ramp and jalapeño for additional warmth. 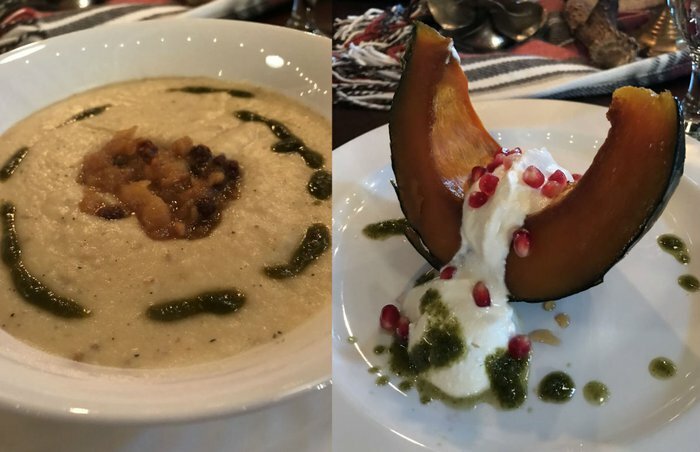 The maple roasted winter squash was slopped with a smoked ricotta cream, peppered with pomegranate and finished with chimichurri. Music to my stomach. Who needs a hunny on Valentine's Day when you have scrumptious little baby cupcakes? 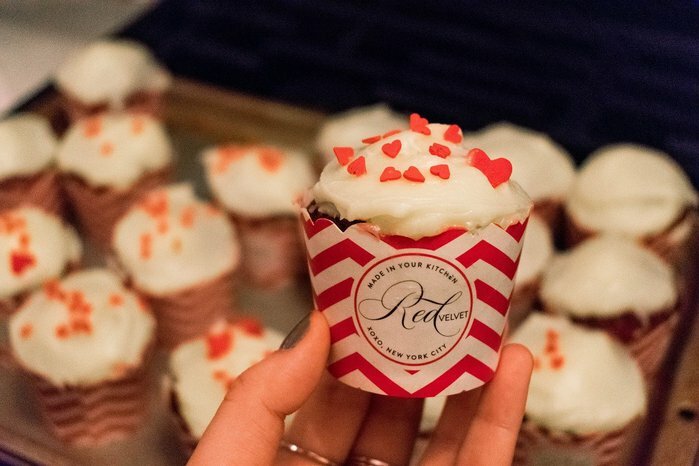 I demo'd Red Velvet NYC's Love Day kit, and now I am a baking queen. Shout out to cream cheese frosting - which I made from scratch - because it is the real MVP. All frosting should aspire to be as bangin' as cream cheese frosting. And these heart-shaped sprinkles? Ugh. Love is in the air (and in my stomach). This isn't your average risotto dish, baby. It was prepared at the home of a woman who is part of Le Cesarine, a network of home cooks who hook up hungry travelers with a true Italian meal. 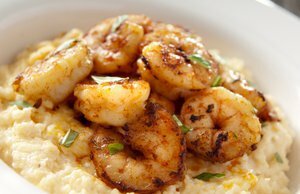 The "bowl" is made of Parmesan cheese, and it's filled with Parmesan risotto splashed with balsamic vinegar. So much cheese, so little time. Thanksgiving dinner at my dad's house was a little non-traditional this year. Everything was made by his girlfriend's mother, who was in town from Canada, and she's a spectacular chef. 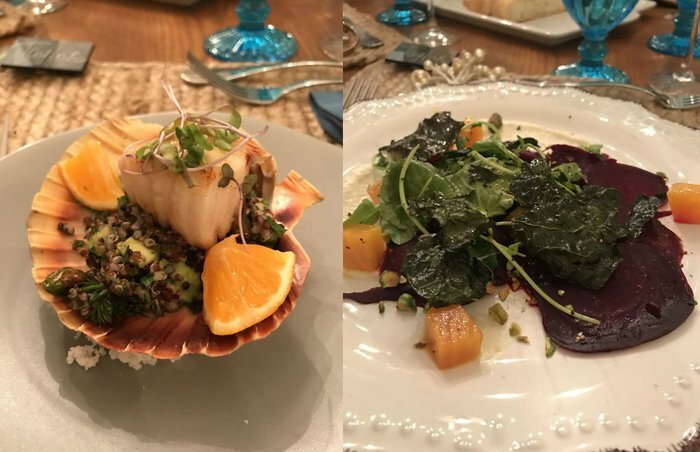 The first course was a scallop with black quinoa tabbouleh and candied kumquats followed by roasted beet salad with honeyed ricotta, pickled beet jam, pistachios and kale chips that tasted just like potato crisps. Turkey, who? Believe it or not, I had never had Shake Shack until this year. The chain launched a limited-edition veggie burger featuring a roasted beet patty topped with provolone cheese, lettuce, white onion, pickles and a vegan mustard-mayo. It tasted so fresh, healthy and delicious, but it doesn't look like the Shack is still serving it, which is le sad. Everybody knows that New Yorkers are ride or die for their bagels, but (trigger warning) sometimes that much bread can make you feel nine months pregnant with a bowling ball. 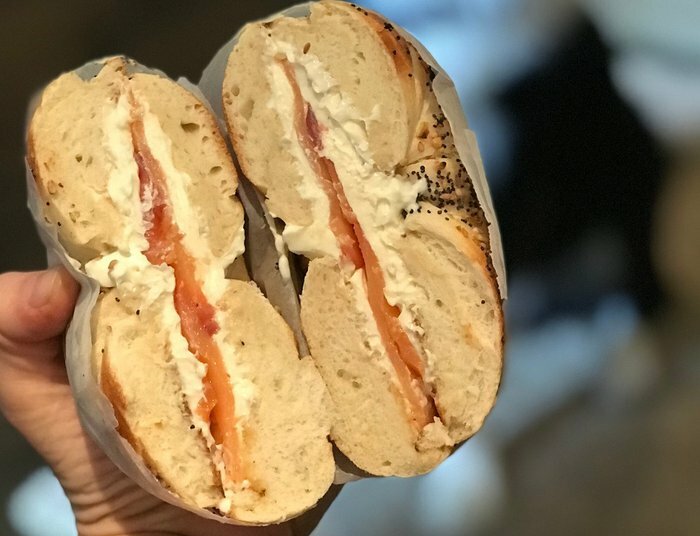 This smoked salmon pizza is from 800 Degrees in Midtown Manhattan, and it's basically the lighter version of their cult-favorite LOX bagel. Its wood-fired crust is coated in everything seasoning and a light cream sauce, then topped with red onion, smoked salmon and sprigs of dill. Long story short, it's heaven in your mouth. So is this accompanying Dutch baby (aka a German pancake) with Greek yogurt, raspberry compote and powdered sugar. It's basically a fancier version of fried bread dough you get at the state fair. Delicious. Smoothie bowls are trendy and delicious. 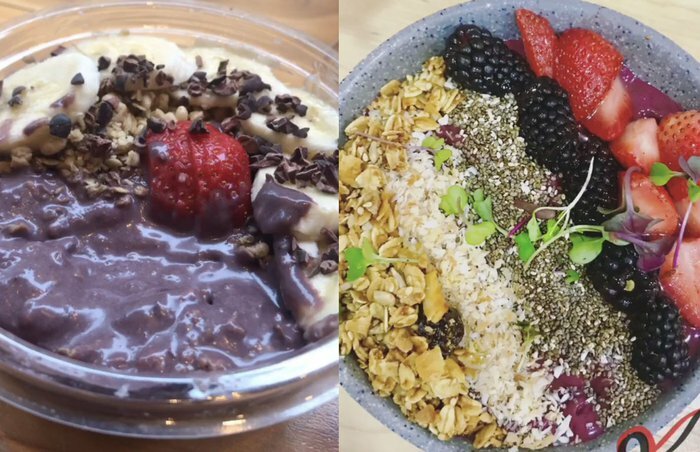 The one on the left is from Juice Press and is made with acai, strawberries, banana, peanut butter, granola and cocoa nibs. The one on the right is from Hole in the Wall, an Australian café in the Financial District. It also had acai, plus coconut, granola, chia seeds, blackberries and strawberries. I'd seen black pasta before, but I'd never been tempted to try it prior to this fateful dinner at Ai Fiori. Formally, this is a Ligurian crustacean ragout with sepia, scallops and minced mollica. For the common folk - including myself - Liguria is a coastal region in northwestern Italy, the crustacean was lobster (I think), sepia is a cuttlefish and mollica is bread crumbs. I don't think the black pasta tastes any different than regular linguine, but the dish was great nonetheless. As was this butter-poached halibut with couscous, morels and wax beans. I may be slightly biased because this sub (hoagie, po'boy, grinder, whatever) is from Zuke's Deli in my hometown, but I have yet to find a better one, and it's all because of the bread. It's freshly made in house, but it's not a roll. It's the fluffiest most outstanding French baguette. I always get the tuna melt with provolone, lettuce and tomato, but the majority of customers order the "Zuke's Special" with turkey breast, boiled ham, melted Swiss cheese, coleslaw and Russian dressing. If I could marry a food, it would be sushi. My favorite affordable takeout option comes from Mirakuya in Bed-Stuy. The menu lists this roll as the Amazing Tuna. On the inside, there's spicy tuna, kani and avocado. Red tuna, white tuna and spicy mayo are on the outside. 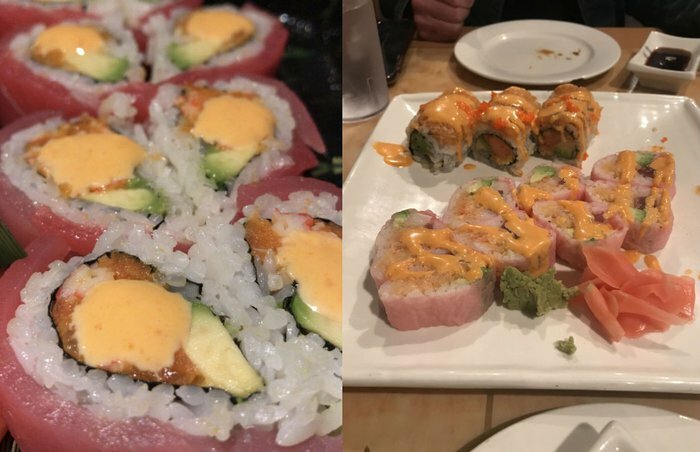 On the right, we have two special rolls from Koto Japanese Steakhouse in Plattsburgh, New York. 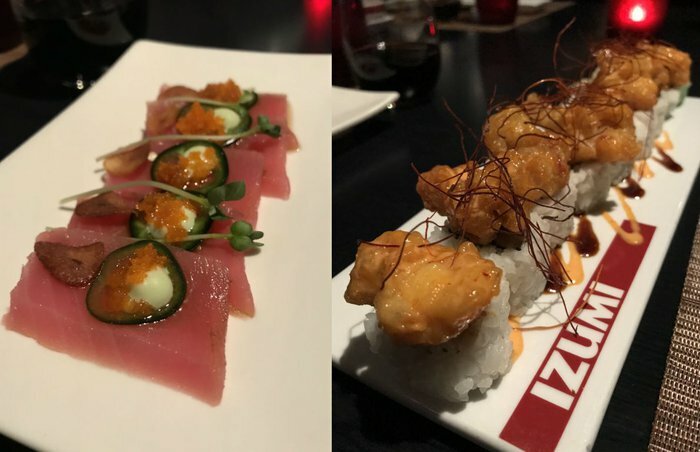 In the foreground is a Snowflake Roll (red tuna, white tuna, avocado, lobster salad, soy seed paper, crunch and eel and spicy sauces) and behind it lies a Mountain Snow Roll (deep-fried fluke, spicy tuna, avocado, red onion and mango with spicy snow crab and red tobiko, plus spicy and eel sauces). OK, I need an intervention. I'm really surprised I didn't get some sort of mercury poisoning this year due to the amount of fish products I've consumed. 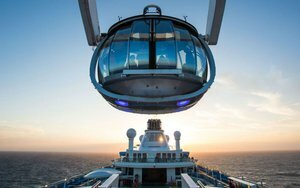 During a trip aboard Royal Caribbean's Symphony of the Seas, I dined at Izumi, which is one of the ship's specialty restaurants. On the left is tuna carpaccio with toasted garlic, jalapeño, roe and some sort of vegetable puree. On the right is a godly truffle lobster tempura roll. Wow. Stick a fork in me. I'm done. Although this seems like such a simple food to rave about, tomatoes grown in Bologna, Italy, are unlike any others. The quality of these tomatoes, which were prepared in the same home as the risotto, were top-notch. Our host added only olive oil and basil, then roasted them in the oven for a short amount of time. The result? Heaven on Earth. They were so soft and juicy, and they were bursting with flavor. So now, the one thing I tell people they have to do when they go to Italy? Eat the tomatoes. When in Italy, one must eat the pizza, but also the pasta. This one hails from a restaurant called Oltre in Bologna, and yes, as a matter of fact, it is stuffed with ricotta cheese. Prego mille. Listen here: This is the best veggie burger I've ever had. OK? Great. It's from Cubana Café in Carroll Gardens. It's topped with avocado, jicama and a super-refreshing mango salad. You can add cheddar or Swiss cheese if you want. The bread is the icing on the cake, though. Instead of a traditional burger bun, it's a beautiful oversized English muffin. Yuca frita, or "fries" made from yuca root, comes on the side. 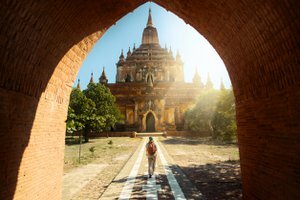 If you ain't about that meatless burger life, get your freak on with these 10 monstrous burgers around the world instead.